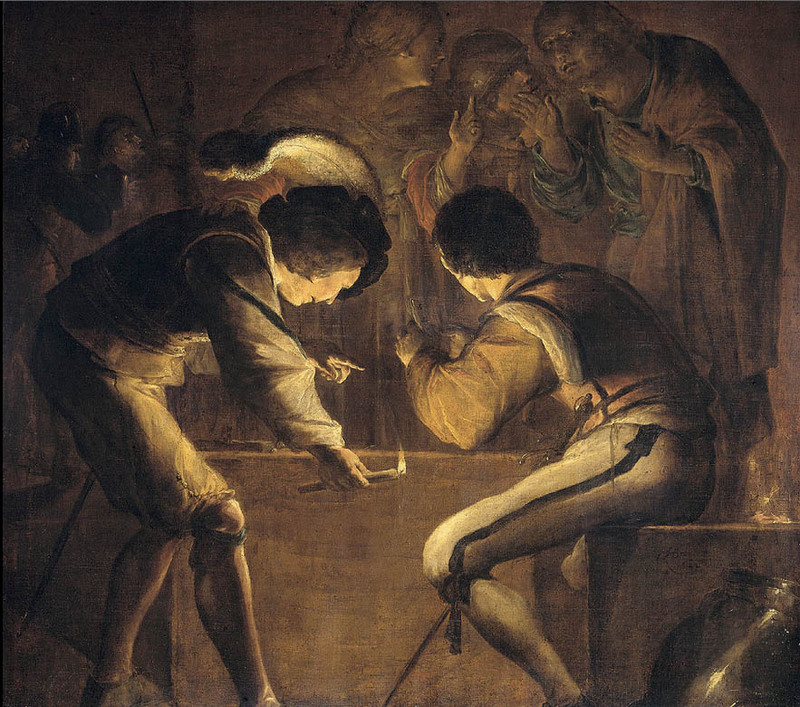 Leonaert Bramer (1596-1674). History painter, also landscape and portrait. Italian sojourn 1614 to before 1628, mastering the fresco technique, under the name Leonardo delle Notti after his darkly lit subjects. He was supported in Italy by his mecenas Prince Mario Farnese. 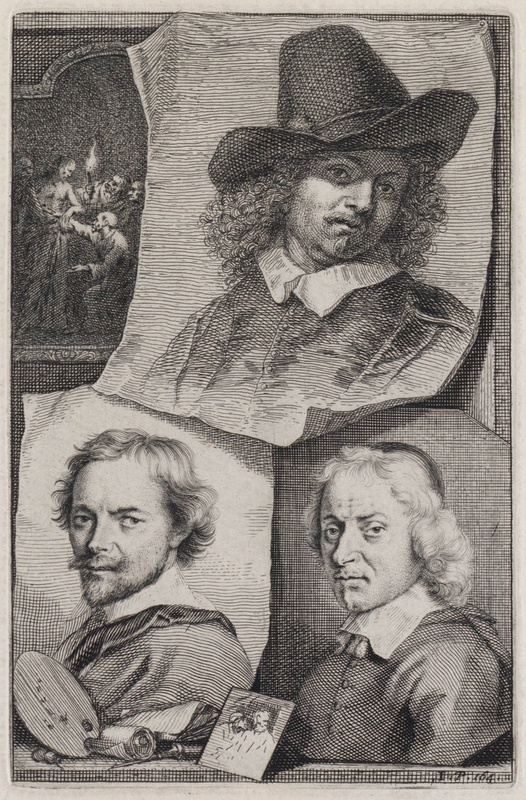 He must have studied Caravaggism in Italy and thus in Delft he had a head start over Willem van Vliet and Van Couwenbergh, local painters with an active interest in Utrecht Carravagist painters. 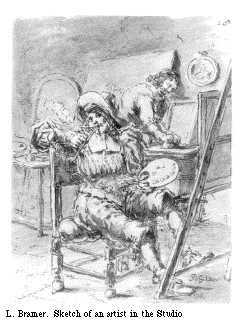 In the Delft Guild in 1629, repeatedly headman. Among his many patrons were members of the House of Orange such as Fredrik Hendrik, and Count Maurice of Nassau. But local burgomasters and aldermen also bought his paintings in great numbers. He was a many-sided designer, working for tapestry firms, designing and painting murals and ceilings, some of which are illusionistic in style, and he crafted real fresco painting, which is a rare feat north of the Alps. Sergeant in the Civic Guard; contracted for the upkeep of paintings in the Doelen (Civic Guards) building. He lived NEXT to the Wapen van Dantzig (Dantzig Arms) which is nr 48, to the north side, on Koornmarkt, probably renting it before 1638 and finally bying it in 1643 for 2500 guilders. In 1653 he was contracted to paint a fresco in a corridor between his house and that of his neighbor, Anthony van Bronchorst on nr. 50. Bramer also painted frescos, now lost, in the Delft Prinsenhof and for houses belonging to Frederik Hendrik and Maurits van Nassau. Between 1660-1668 the Town of Delft ordered paintings for a total of 2330 guilders. 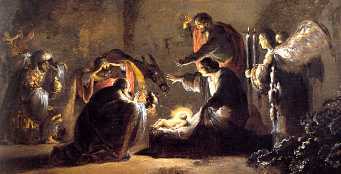 The image above shows an detail from The Adoration of the Shepherds by Bramer. 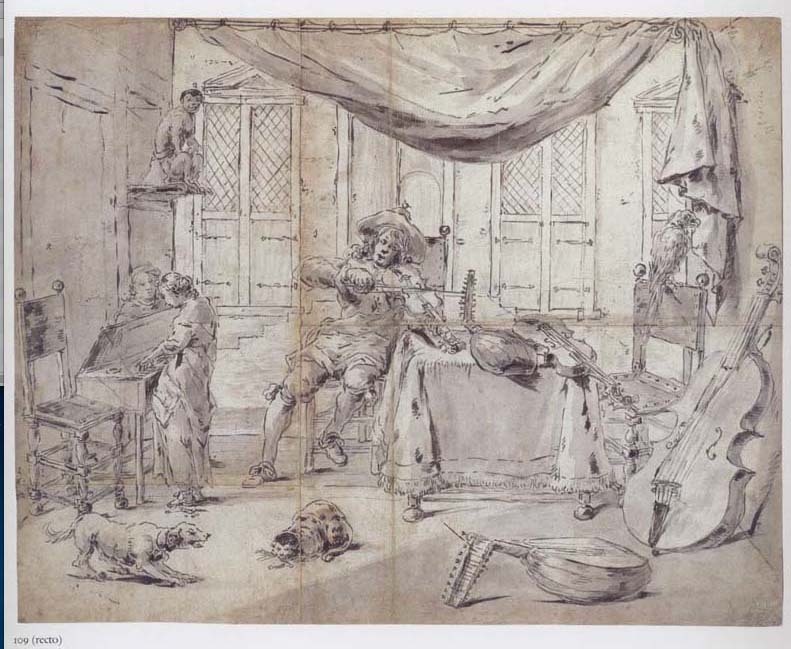 His famous Album Bramer (drawn between 1642-1654, now in Leiden) contains many sketches after paintings in Delft collections. In 1648 he purchased a house on the north side of Pieterstraat for 910 guilders and lived there in 1658 according to one source. Two adjacent houses on the north side of Pieterstraat were sold in 1668 for 400 guilders. He lived again on Koornmarkt in 1670 and died there. Bramer contributed to the interior decoration of the Guild hall. This is what Van Bleyswijck, Author of History op Delft wrote in 1667 about the interior of the large upstairs room within this building in which the Guild members met for official business. May have influenced Abraham Pietersz Vromans and Pieter Pietersz Vromans. Bramer is depicted here at the bottom left. Leonard Bramer Peters Denial, 1642 Rijksmuseum Amsterdam, -legs DesTombe, 1903 the latter also donated Vermeer's Girl with Pearl Earring. Note. Wichmann 1918, p. 4, 6,7 notes that fresco technique is very rare in the seventeenth century Republic; he also mentions Rome travel in 1648. Bramer paid 2500 guilders for the Danzig Arms on 20 January 1643. Source: (NA 1691, Not. W. de Langue), also in Ten Brink Goldsmith Bramer (1994) 18 probably based on Soutendam, Necrologium, p. 26. The word fresco is used in the Bronchorst contract, RKD Bredius archive, artist folder, quoting doc. 28 Dec. 1653. In a private communication Montias, 2000, states that Anthonie Palamedes bought a house next to Bramer's for 900 f. on Coorenmarckt, south side of Burchwal (NA 1691, Not. 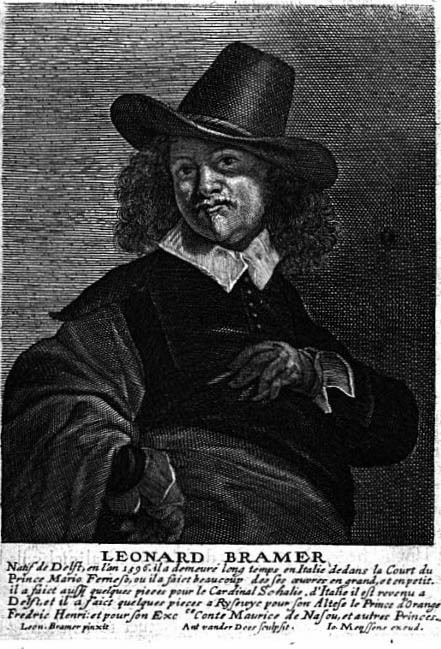 W. de Langue), 23 January 1643). However this latter house is hard to pinpoint as these two streets are close together but do not intersect. Montias (1993) p. 194 also mentions the Civic Guard. Arnold Houbraken, De groote Schouburgh der Nederlantsche Konstschilders en Schilderessen, The Hague 1752 [2nd ed.] Book 1, page 164. 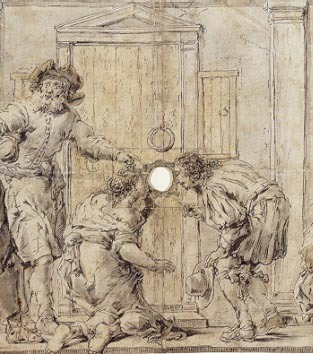 Below is a funny drawing of a much interested persons, looking through a peep hole in a door, a source of great public attention.